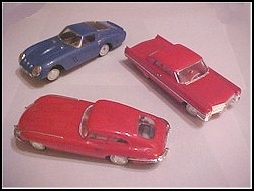 A very entertaining slot car set was the Motorific Line made by Ideal. These came in a variety of sets, separate cars, trucks, boats (called Boaterifics) and accessories. What was different about Motorific was that each car or truck was powered by two AA batteries. There was no contacts in the track. Hence, track assembly was VERY easy, although you could not control the speed of the car. There were really three different types of sets. Motorific: These were the first, originally designed as 'test tracks', with a variety of tests that are performed on the car, as if it was a large proving ground. Tests included horsepower test, steering test, spring test, and crash test. Racerific: These used the same track as Motorific, but they added a timer and additional items to each set. The idea was to compete with others to see who could get through the course in the shortest amount of time, or in a rally scenario, who could come closest to the handicap time. Highway Sets: Larger track, packed with trucks that did all sorts of things.